With Rio+20 taking place this weekend, everybody should be ready for many sparky and sparkling arguments. To get nations working on sustainable energy and development, there is no better organisation than Ecofys. Since 1984 they have built up bases in many countries and experts to define the status quo on most technologies available. They have proposed 21 major initiatives to get the planet rolling. Ecofys have just released a paper, published in the journal Nature Climate Change, compiled by four of their expert researchers, Kornelis Blok, Niklas Höhne, Kees van der Leun and Nicholas Harrison, which lays out the proposals in detail. The 21 parts of the plan could stimulate a reduction of 10 gigatonnes of CO2 equivalent by 2020. 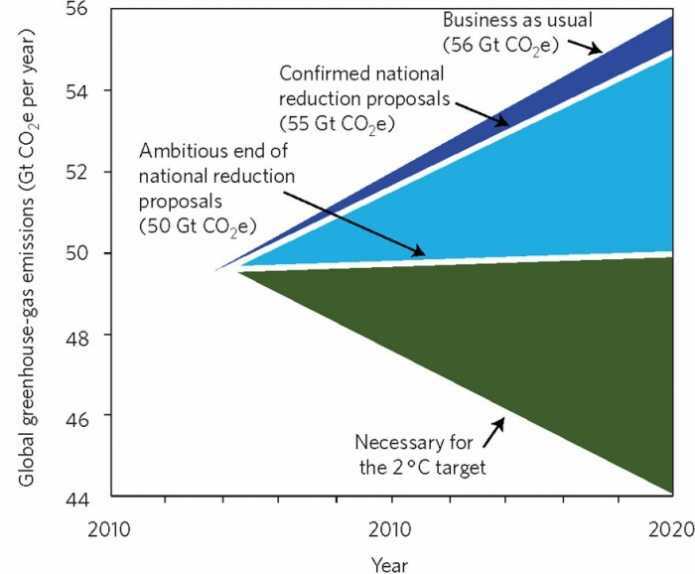 United Nations proposals currently do far less to reduce emissions, considering we are aiming to limit the global temperature imcrease to 2°C above base level (pre-industrial levels, that is) before 2020. Ordinary people, cities, companies and government should act as people already do by taking on green growth and its associated action in every country. 30% of the top 1000 global companies could reduce emissions by 10% below "business-as-usual" by 2020! (all companies would be able hopefully to reduce non CO2 greenhouse gas emissions by 50% overall). 40 cities in C40 or their equivalent could reduce emissions by 20% below "business-as-usual" by 2020, to provide an equal impact to that of the top companies. Kees van der Leun, who is the COO at Ecofys, believes the catalytic effect of such action would be enormously beneficial. He has made this effect the key to the organisation's approach. What has propelled his organisation's initiative is the realisation by all concerned that in 2009, the UN climate conference in Copenhagen failed to live up to its promise. Agreements in Cancún and Durban revived the international process, but were not able to generate more ambition. Now, in Rio many are saying this is our last chance to make enough progress before environmental disasters begin to be unavoidable. Just like the ancient prophet, it's easy to say what should happen. In the same way, many claim that events are not what scientists claim them to be. The truth however is hard to avoid. We do need to act before this conference closes. All of those involved are tending towards the belief that there will be little chance to act in the future (or even next week!). Many of the 21 initiatives involve areas such as air pollution and deforestation. These alone would also help countries to escape from gruesome effects on biodiversity and loss of natural environments and ecologies. Use of new cooking stove technology for individuals or "bribery" to prevent useless deforestation (possibly even in the same forest) would have obvious effects on harmful pollution and people's health. The catalytic effect proposed by Kees van der Leun has possibilities below the multinational level too. People, organisations and government are being persuaded in a long hard process to see the complexity within their lives and the multiple effects of their actions. As Ecofys put it, it's "Wedging the Gap," for and to, all and sundry. Till we reach that goal in 2020. By then it seems certain we won't have another chance.